I was listening to the Suiting Up podcast with Paul Rabil and he was interviewing the creators of The Lacrosse Network, Samir Chaudry and Colin Rosenblum and they said to those who wanted to create content, ‘Create it right now. You have to make it’. I was listening to another Suiting Up episode where Rabil interviews Gary Vaynerchuk, a famous entrepreneur and investor, and he thought that podcasts were going to continue to trend upward and argued that a podcast is something you can listen to while doing another thing. I was working as he said that so it rang true. With those two insights, I emailed the coaching staff to see what they thought about the idea. They were all in. The story I am going to tell is two-fold. The first aspect is a behind the scenes, insider look into the 2018 Utah Men’s Lacrosse team. We’ll (the listener, me and the guests) will dive into the schedule, roster, opponents, coaching, recruits, etc. I’m going to hope to provide you, the listener, a unique point of view as I spend time with the team. 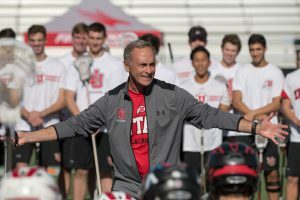 The second aspect will be a broader look into lacrosse in the West, lacrosse in Utah, trends in lacrosse, building a program, NCAA D-I lacrosse, life lessons and more. I’d also like to thank Robert Nelson at the Marriott Library for catching the vision and allowing us to use the student studio in the library. It’s an incredible resource for students. With that said, Jake Melville will be producing each podcast. It only made sense for the first guest to be head coach Brian Holman. You can read his bio here. If you have met or know Coach Holman, then you’ll really enjoy this podcast. If you haven’t met him, I don’t want to say too much so you can form your own opinions. I think he’s great and he’s a great person to listen to. I can only imagine what it’s like to play for him. The image I used with this episode is a true look into the passion he has for lacrosse. This is in front of 200 youth players at a clinic in San Fransisco. He once told me his favorite place is a practice field and I truly believe it.